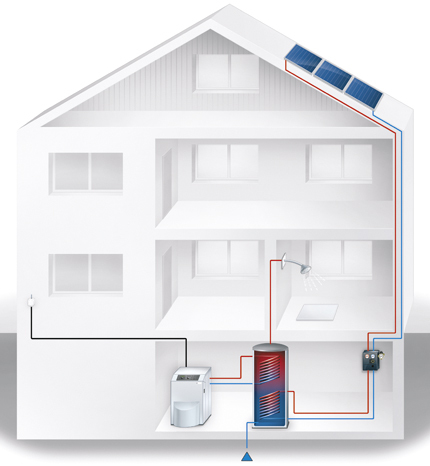 The sun is the biggest supplier of energy to the earth, and provides the starting point for an environmentally sound way to obtain energy: solar thermal energy. To supplement a gas, oil or electrically powered heating system or as a constituent element in an ice storage heating system, a solar plant converts free solar power into heat. To achieve a regular plant service life of 20 to 25 years, every single component needs to be manufactured to a high quality standard. As a collector or storage sensor, we recommend the TF45 plug-in thermometer, available with a vast array of measuring elements and switchgear. You can protect your storage heating unit from overheating through the use of an SB15 safety temperature limiter. This shuts down the solar circuit pump and prevents the storage vessel from overheating, thereby also preventing the build-up of steam in the drinking water circuit. Pressure monitoring plays an equivalently important role to temperature monitoring. The pressure conditions in the solar circuit have a decisive impact on the efficiency and service life of a solar power plant. To monitor the prevailing pressure level, you can choose from a range of mechanical pressure gauges (111), as well as from a range of mechatronic pressure gauges with switching function (PGS) or ones with an electrical output signal (PGT).